Looks so good! This is my favorite kind of pizza. P.S. Your post is up over on my blog. Looks great! Oh my gosh. This looks amazing! Will definitely have to try this out. yum! i love pizza! and your one looks stunning! please check out my blog and don't be afraid to leave a comment! looks amazing! my hubby would love it too! Perfect for today. There is something about pizza and Sunday, it's just that both goes together in my mind. Yum! I never made pizza crust from scratch, but I want to. I am going to try your recipe! Wish my Hubby liked BBQ Chicken Pizza, but he's so traditional and set in his ways, I can't change him! This looks delicious. I don't know that I am smart enough to make my own dough though. Do you have to have a stand mixer? 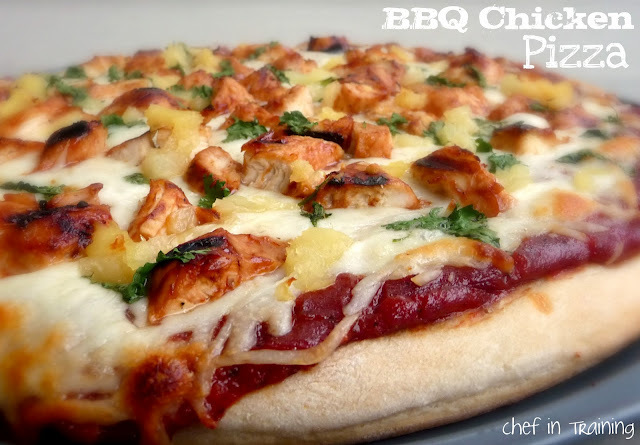 One of my favourite pizza BBQ Pizza. I needPizza Equipment for Apple Pizza. any one can help me? Awesome pizza I really like pizza no matter whether it veg- non veg I liked your recipe too.